This massage is a type of massage therapy specializes in treating painful conditions which affect the soft tissues of the body. The massage service may integrate a range of therapy to treat these conditions. Ideally adapting her style for each client, as every person's body is slightly different. This type of massage may be recommended by a physician who wants there patient to pursue multiple modalities, and people can also see an Orthopedic Massage therapist independently. A therapist who focuses on musculoskeletal system, he/she may release tight muscles to help to stretch shortened muscles and tendons and decompress joints. The goal is to normalize the soft tissues of the body. Both to treat specialized conditions and to keep clients healthy and fit. This type of Orthopedic Massage goes below the superficial layers of tissue to the deep muscles and tendons where structural problems originate. Through manipulation of these muscles and ligaments they are brought back to their true alignment. This not only relieves nerve pressure, restriction of movement, fatigue, and painful muscles, it also brings the posture into a more natural alignment. Painful "knots" from tension are released. Deep Fascia Manipulation and Trigger Point Therapy are designed to alleviate pain and get to the root of the problem. This is a new approach to Therapeutic Massage and is drug-free solution to chronic pain. All services purchased as a series, or a special value package, are non-refundable, and valid for 6 months. All Sales are Final. Special value packages pricing and quantities are subject to change. Packages Are Available for Out-Calls! The therapist applies slow strokes and pressure, directing fingers, thumbs, and elbows across the grain of the muscles and tendons. These movements focus on specific areas and are applied with greater pressure. This addresses the neuromuscular components of pain by finding their origins and performing soft tissue work to release the unbalanced muscles and connective tissue. Purchase ten hours of work, 60 minute sessions at $2,150, can be extended up to three hours in one session. All services purchased as a series, or a special value package, are non-refundable, and valid for 6 months. All sales are final. Special value packages pricing and quantities are subject to change. Both of these modalities are recommended two–three times a week for 5 weeks or twice a week for 10 weeks, or as needed. Also at times this therapy uses a hydrocalculator to loosen up tight muscles or a hot pack. One–hour sessions are offered, longer sessions are recommended as it usually takes 90 minutes to two hours to physically complete. This type of massage manipulates each part of the body through five basic movements; long gliding strokes, kneading of individual muscles, a percussive, tapping movement designed to stimulate the nervous system, a rolling movement of the fingers and gentle vibration of the body. Light to medium pressure is applied in the direction blood flows toward the heart. It is believed this motion increases the circulation of blood through soft tissues. Swedish massage promotes relaxation by stimulating and soothing the skin and nervous system. This is our client's most favored form of massage therapy. It is a combination of two great modalities of massage. This is your classic massage combined with Asian body work. See above for Swedish Massage and Acupressure descriptions. The ultimate pampering! One session will reduce stress and improve sleep. The special technique of lymph drainage requires practice, sensitivity and a profound knowledge of the location of the major lymph nodes in the treated areas. It is a highly appreciated form of cosmetic treatment for the face, neck and shoulders. Skin and subcutaneous tissues are stimulated to regenerate by an inner cleaning and a soft, manual manipulation of the lymph flow. Draining of the network of lymphatic vessels reduces swollen or puffy tissues. A series of cosmetic lymph drainage treatments tones underlying tissue and improves the look of your skin. Reflexology is a complimentary healing process to the benefits of Massage Therapy. Early Chinese healers subscribed to the theory that the feet are the body's control center. All energy paths which run through the body converge in the feet. Each organ of the body is represented by a corresponding reflex point. Reflexology uses pressure, rubbing, pulling, and massaging of the appropriate points of the feet and ankles to release blockages and thus revitalize the health of the corresponding organ. Many doctors and therapists are beginning to recommend Reflexology as a vital part of the holistic healing process. A relaxing massage using hot towels to help revitalize those tired feet and achy legs. It improves blood circulation, and deep relaxation is induced. Treatments work with the energy pathways of the body, known as meridians. The technique uses hand manipulations to exert gentle to strong, deep pressure on "trigger" points along specific meridians. This will calm and/or harmonize the functions of the body and mind, resulting in relaxation and reduction of stress. Acupressure is also a good method for bringing the body back to a state of calmness and tranquility. This type of acupressure technique that accesses the flow of Qi (life force) in the body, bringing to the recipient a sense of well-being, health, and relaxation. Acupressure points are held in specific patterns designed to replenish and harmonize the vital energy of the body, mind, and spirit. This gentle noninvasive therapy is both subtle and deep. It is an excellent treatment modality for injuries, headaches, neck and shoulder tension, and TMJ. Hot Stones are used on acupressure points on the face to reduce discomforts such as headaches, TMJ, and sinus. This is a popular non-evasive method to maintain beauty, radiance and vitality in the face to improve one's health and well-being. This session will include an intake discussion and analysis of your face and health and Joanna's unique hands-on approach destresses the face. This is an exceptional hot stone facial massage. Light to medium pressure is applied in the direction blood flows toward the heart with the hot stones. It is believed this motion increases the circulation of blood through soft tissues. Swedish Hot Stone Massage promotes relaxation by stimulating and soothing the skin and nervous system. With the pressure applied by the Hot Stones, this addresses the neuromuscular components of pain by finding their origins and performing soft tissue work to release the unbalanced muscles and connective tissue. The technique uses Japanese Hot Stone manipulations to exert gentle to strong, deep pressure on "trigger" points along specific meridians. This will calm and/or harmonize the functions of the body and mind, resulting in relaxation and reduction of stress. This is our client's most favored form of hot stone massage therapy. It is a combination of two great modalities of stone massage. This is your classic stone massage combined with Asian stone work. 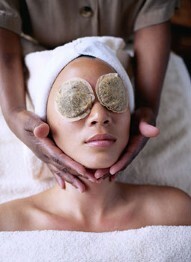 The ultimate pampering! One session will reduce stress and improve sleep.